Yesterday I began with two line forms canted toward each other. I thought it would be interesting to try the same thing with curved lines. I also replaced the arcs that hugged the straight lines in yesterday’s study, with triangles surrounding the arched lines in today’s design. True to form, I had an unfortunate incident with an ink blot (see Best Laid Plans, for other recent mistakes). I was using one of those pens that have a metal ball inside that mix the ink. Also, it is necessary to prime it by depressing the point, allowing the ink to flow to the nib. It flowed all right, immediately after forming a very large droplet at the end of the nib. I didn’t notice it until it dropped onto the paper. I felt compelled to do it a second time to make it seem that the first drop was on purpose. 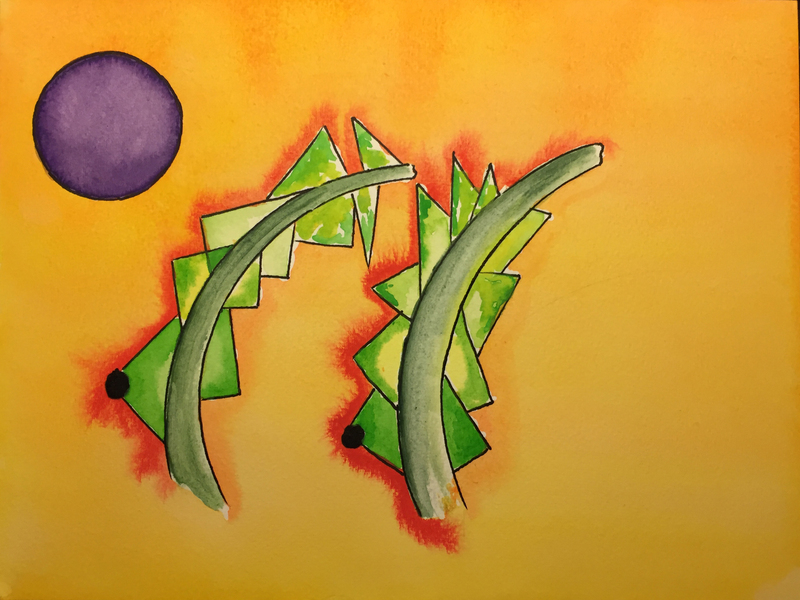 The resulting watercolor drawing, originally intended to be two plants, phobic of the purple sun’s rays, became two ambiguous organisms (neither plant nor animal), either purple-sun phobic or philic, respectively. Anyway, that’s my story and I’m sticking to it. I’m sure that some of you have better stories, though. I’d love to hear them. This entry was posted in Personal Stories and tagged abstract art, abstract expressionism, ambiguity, art, artistic process, creative process, creativity, drawing, pen and ink, watercolor. Bookmark the permalink.